The áo dài is a Vietnamese national garment, worn by both sexes but now most commonly worn by women. In its current form, it is a tight-fitting silk tunic worn over trousers. Áo translates as shirt. Dài means "long". The word "ao dai" was originally applied to the outfit worn at the court of the Nguyễn Lords at Huế in the 18th century. This outfit evolved into the áo ngũ thân, a five-paneled aristocratic gown worn in the 19th and early 20th centuries. Inspired by Paris fashions, Nguyễn Cát Tường and other artists associated with Hanoi University redesigned the ngũ thân as a modern dress in the 1920s and 1930s. The updated look was promoted by the artists and magazines of Tự Lực văn đoàn (Self-Reliant Literary Group) as a national costume for the modern era. In the 1950s, Saigon designers tightened the fit to produce the version worn by Vietnamese women today. The dress was extremely popular in South Vietnam in the 1960s and early 1970s. On Tết and other occasions, Vietnamese men may wear an áo gấm (brocade robe), a version of the ao dai made of thicker fabric. Diagram that shows the parts of an ao dai. The ao dai can be worn with a nón lá (conical leaf hat), a style associated with Huế. On weddings and other formal occasions, a circular headgear called a khăn đóng is worn. For centuries, peasant women typically wore a halter top (yếm) underneath a blouse or overcoat, alongside a skirt (váy). Aristocrats, on the other hand, favored a cross-collared robe called áo giao lĩnh, which bore resemblance to the Chinese Hanfu. In 1744, Lord Nguyễn Phúc Khoát of Huế decreed that both men and women at his court wear trousers and a gown with buttons down the front. [b] Writer Lê Quý Đôn described the newfangled outfit as an áo dài (long garment). [c] The members of the southern court were thus distinguished from the courtiers of the Trịnh Lords in Hanoi, who wore áo giao lĩnh with long skirts. Chinese Ming style clothing was forced on Vietnamese people by the Nguyễn dynasty. The tunics and trouser clothing of the Han Chinese on the Ming and Qing tradition was worn by the Vietnamese. However, Han-Chinese clothing is assembled by several pieces of clothing including both pants and skirts called Qun (裙) or chang (裳) which is a part of Hanfu garments throughout the history of Han Chinese clothing. The Ao Dai was created when tucks which were close fitting and compact were added in the 1920s to this Chinese style. The Chinese clothing in the form of trousers and tunic were mandated by the Vietnamese Nguyen government. It was up to the 1920s in Vietnam's north area in isolated hamlets where skirts were worn. The Chinese Ming dynasty, Tang dynasty, and Han dynasty clothing was referred to be adopted by Vietnamese military and bureaucrats by the Nguyen Lord Nguyễn Phúc Khoát (Nguyen The Tong). Chinese clothing started influencing Vietnamese dress in the Ly dynasty. The current Ao Dai was introduced by the Nguyen Lords. The áo ngũ thân had two flaps sewn together in the back, two flaps sewn together in the front, and a "baby flap" hidden underneath the main front flap. The gown appeared to have two-flaps with slits on both sides, features preserved in the later ao dai. Compared to a modern ao dai, the front and back flaps were much broader and the fit looser and much shorter. It had a high collar and was buttoned in the same fashion as a modern ao dai. Women could wear the dress with the top few buttons undone, revealing a glimpse of their yếm underneath. Huế's Đồng Khánh Girl's High School, which opened in 1917, was widely praised for the ao dai uniform worn by its students. The first modernized ao dai appeared at a Paris fashion show in 1921. In 1930, Hanoi artist Cát Tường, also known as Le Mur, designed a dress inspired by the áo ngũ thân and by Paris fashions. It reached to the floor and fit the curves of the body by using darts and a nipped-in waist. When fabric became inexpensive, the rationale for multiple layers and thick flaps disappeared. Modern textile manufacture allows for wider panels, eliminating the need to sew narrow panels together. The áo dài Le Mur, or "trendy" ao dai, created a sensation when model Nguyễn Thị Hậu wore it for a feature published by the newspaper Today in January 1935. The style was promoted by the artists of Tự Lực văn đoàn ("Self-Reliant Literary Group") as a national costume for the modern era. The painter Lê Phô introduced several popular styles of ao dai beginning in 1934. Such Westernized garments temporarily disappeared during World War II (1939–45). In the 1950s, Saigon designers tightened the fit of the ao dai to create the version commonly seen today. Trần Kim of Thiết Lập Tailors and Dũng of Dũng Tailors created a dress with raglan sleeves and a diagonal seam that runs from the collar to the underarm. Madame Nhu, first lady of South Vietnam, popularized a collarless version beginning in 1958. The ao dai was most popular from 1960 to 1975. A brightly colored áo dài hippy was introduced in 1968. The áo dài mini, a version designed for practical use and convenience, had slits that extended above the waist and panels that reached only to the knee. The ao dai has always been more common in the South than in the North. The communists, who gained power in the North in 1954 and in the South in 1975, had conflicted feelings about the ao dai. They praised it as a national costume and one was worn to the Paris Peace Conference (1969–73) by Vietcong negotiator Nguyễn Thị Bình. Yet Westernized versions of the dress and those associated with "decadent" Saigon of the 1960s and early 1970s were condemned. Economic crisis, famine, and war with Cambodia combined to make the 1980s a fashion low point. The ao dai was rarely worn except at weddings and other formal occasions, with the older, looser-fitting style preferred. Overseas Vietnamese, meanwhile, kept tradition alive with "Miss Ao Dai" pageants (Hoa Hậu Áo Dài), the most notable one held annually in Long Beach, California. The ao dai experienced a revival beginning in late 1980s, when state enterprise and schools began adopting the dress as a uniform again. In 1989, 16,000 Vietnamese attended a Miss Ao Dai Beauty Contest held in Ho Chi Minh City. When the Miss International Pageant in Tokyo gave its "Best National Costume" award to an ao dai-clad Trường Quỳnh Mai in 1995, Thời Trang Trẻ (New Fashion Magazine) claimed that Vietnam's "national soul" was "once again honored". An "ao dai craze" followed that lasted for several years and led to wider use of the dress as a school uniform. No longer deemed politically controversial, ao dai fashion design is supported by the Vietnamese government. It is often called áo dài Việt Nam to link it to patriotic feelings. Designer Le Si Hoang is a celebrity in Vietnam and his shop in Saigon is the place to visit for those who admire the dress. In Hanoi, tourists get fitted with ao dai on Luong Van Can Street. The elegant city of Huế in the central region is known for its ao dai, nón lá (traditional leaf hats), and well-dressed women. The ao dai is now a standard for weddings, for celebrating Tết and for other formal occasions. It's the required uniform for female teachers (mostly from high school to below) and female students in common high schools in the South; there is no requirement for color or pattern for teachers while students use plain white with some small patterns like flowers for school uniform. Companies often require their female staff to wear uniforms that include the ao dai, so flight attendants, receptionists, bank female staff, restaurant staff, and hotel workers in Vietnam may be seen wearing it. The most popular style of ao dai fits tightly around the wearer's upper torso, emphasizing her bust and curves. Although the dress covers the entire body, it is thought to be provocative, especially when it is made of thin fabric. "The ao dai covers everything, but hides nothing", according to one saying. The dress must be individually fitted and usually requires several weeks for a tailor to complete. An ao dai costs about $200 in the United States and about $40 in Vietnam. "Symbolically, the ao dai invokes nostalgia and timelessness associated with a gendered image of the homeland for which many Vietnamese people throughout the diaspora yearn," wrote Nhi T. Lieu, an assistant professor at the University of Texas at Austin. The difficulties of working while wearing an ao dai link the dress to frailty and innocence, she wrote. 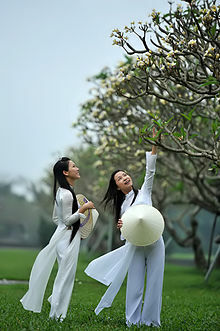 Vietnamese writers who favor the use of the ao dai as a school uniform cite the inconvenience of wearing it as an advantage, a way of teaching students feminine behavior such as modesty, caution, and a refined manner. The ao dai is featured in an array of Vietnam-themed or related movies. In Good Morning, Vietnam (1987), Robin Williams's character is wowed by ao dai-clad women when he first arrives in Saigon. The 1992 films Indochine and The Lover inspired several international fashion houses to design ao dai collections, including Prada's SS08 collection and a Georgio Armani collection. In the Vietnamese film The White Silk Dress (2007), an ao dai is the sole legacy that the mother of a poverty-stricken family has to pass on to her daughters. The Hanoi City Complex, a 65-story building now under construction, will have an ao dai-inspired design. Vietnamese designers created ao dai for the contestants in the Miss Universe beauty contest, which was held July 2008 in Nha Trang, Vietnam. The most prominent annual Ao Dai Festival outside of Vietnam is held each year in San Jose, California, a city that is home to a large Vietnamese American community. This event features an international array of designer ao dai under the direction of festival founder, Jenny Do. Fast pace of life in Vietnam during the decades of integration and development witnesses the changes in the traditional ao dai. This does not mean that the traditional ao dai is disappearing from Vietnamese life. Yet, it is becoming more adaptable to these modern days. The growing of the country day by day requires the changing and the ability of adapting. The traditional ao dai is not the exception. It is not because the design of the ao dai does not fit to the aesthetic point of view of modern Vietnamese. Actually, because the traditional ao dai is inconvenient in daily life, it must be “modernized”. Indeed, the design of the ao dai is no longer suitable for working or travelling on transportation. Moreover, the extreme weather in Viet Nam makes citizens uncomfortable when wearing the ao dai. Besides, it is wardrobe malfunction that causes to the fear of wearing the ao dai in daily activities. Thus, people change the ao dai in its designs and materials so that wearers find it more comfortable and convenient. The modern ao dai turned up several years ago. However, the ao dai was a concern of people who need to wear it as a uniform such as: teacher, flight attendance, receptionists. It was not until the end of the year 2016 did the modern ao dai become so popular with hundreds of new designs. It is modified in the collar, the sleeves or the length of two flaps. Furthermore, instead of wearing pants with the ao dai, people nowadays prefer to wear culottes and skirts inside it. Not only the change in designs, people also use different materials for the modern ao dai like silk, brocade fabric or voile fabric. Along with the wave of the modern ao dai, there is criticism about these transformation. People who want to reserve traditional value in the ao dai argue that the modern ao dai is miscellaneous. Mr. Duc Hung, Vietnamese famous designer, also raised his opinion about this issue: “I do assert that it is not the ao dai of Viet Nam. If we continue to advocate the trend of the modern ao dai, the traditional ao dai will be buried in oblivion…”. In spite of this, there are still a lot of favor from Vietnamese youngsters to the modern ao dai. Printed Ao dai in front, Western outfit in the background. Young woman in a white áo dài. Young girls in ao dai by the Hoan Kiem Lake. ^ "Ao dai" appears in the Oxford English Dictionary, the American Heritage Dictionary (2004), and the Random House Unabridged Dictionary (2006). Other Vietnamese words that appear include "Tet", "Vietminh", "Vietcong", and "pho" (rice noodles). ^ Lê Quý Đôn, Phủ Biên Tạp Lục [Frontier Chronicles] (1775–1776), "Lord Nguyễn Phúc Khoát wrote the first page in the history of the áo dài." "Chúa Nguyễn Phúc Khoát đã viết những trang sử đầu cho chiếc áo dài như vậy." ^ Áo is derived from a Middle Chinese word meaning "padded coat". "ao dai", definition of ao dai in Oxford dictionary (British & World English). Retrieved November 3, 2014. ^ Phan Van Giuong, Tuttle Compact Vietnamese Dictionary: Vietnamese-English English-Vietnamese (2008), p. 76. "dài adj. long, lengthy." ^ a b c d e f g Ellis, Claire (1996). "Ao Dai: The National Costume". Things Asian. Archived from the original on July 5, 2008. Retrieved August 2, 2008. ^ a b c Lieu, Nhi T. (2000). "Remembering 'the Nation' through pageantry: femininity and the politics of Vietnamese womanhood in the 'Hoa Hau Ao Dai' contest". Frontiers: A Journal of Women Studies. University of Nebraska Press. 21 (1–2): 127–151. doi:10.2307/3347038. JSTOR 3347038. ^ Niessen, S. A.; Leshkowich, Ann Marie; Jones, Carla, eds. (2003). Re-Orienting Fashion: The Globalization of Asian Dress. Berg. p. 89. ISBN 978-1-85973-539-8. ^ a b Vu, Thuy (2014). "Đi tìm ngàn năm áo mũ". Tuoi Tre. Archived from the original on June 17, 2015. Retrieved June 16, 2015. ^ T.Van (2013). "Ancient costumes of Vietnamese people". Vietnamnet. Retrieved June 16, 2015. ^ Alexander Woodside (1971). Vietnam and the Chinese Model: A Comparative Study of Vietnamese and Chinese Government in the First Half of the Nineteenth Century. Harvard Univ Asia Center. pp. 134–. ISBN 978-0-674-93721-5. ^ Globalization: A View by Vietnamese Consumers Through Wedding Windows. ProQuest. 2008. pp. 34–. ISBN 978-0-549-68091-8. ^ Ay-leen the Peacemaker (March 14, 2010). "Transcultural Tradition of the Vietnamese Ao Dai". Beyond Victoriana. ^ Ay-leen the Peacemaker (October 20, 2010). "The Ao Dai and I: A Personal Essay on Cultural Identity and Steampunk". Tor.com. ^ Anthony Reid (June 2, 2015). A History of Southeast Asia: Critical Crossroads. John Wiley & Sons. pp. 285–. ISBN 978-0-631-17961-0. ^ A. Terry Rambo (2005). Searching for Vietnam: Selected Writings on Vietnamese Culture and Society. Kyoto University Press. p. 64. ISBN 978-1-920901-05-9. ^ Jayne Werner; John K. Whitmore; George Dutton (August 21, 2012). Sources of Vietnamese Tradition. Columbia University Press. pp. 295–. ISBN 978-0-231-51110-0. ^ "Vietnamese Ao Dai: From Dong Son bronze drum to int'l beauty contests". VietnamNet Bridge. February 28, 2016. ^ a b Leshkowich (2003), p. 91. ^ "A Fashion Revolution". Ninh Thuận P&T. Archived from the original on June 23, 2008. Retrieved August 2, 2008. . For a picture of the áo dài Le Mur, see Ao Dai — The Soul of Vietnam[permanent dead link]. ^ "Vietnamese Ao dai history". Aodai4u. Retrieved August 2, 2008. ^ Elmore, Mick (September 17, 1997). "Ao Dai Enjoys A Renaissance Among Women : In Vietnam, A Return to Femininity". International Herald Tribune. 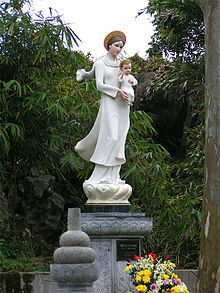 ^ Bich Vy-Gau Gi, Ao Dai — The Soul of Vietnam[permanent dead link]. Retrieved on July 2, 2008. ^ a b "Vietnamese AoDai". Overlandclub. Archived from the original on March 19, 2008. Retrieved July 2, 2008. ^ a b Leshkowich (2003), p. 92. ^ a b c Valverde, Caroline Kieu (2006). "The History and Revival of the Vietnamese Ao Dai". NHA magazine. Archived from the original on July 4, 2008. Retrieved August 2, 2008. ^ Vu, Lan (2002). "Ao Dai Viet Nam". Viettouch. Retrieved July 3, 2008. ^ Leshkowich (2003), p. 79. ^ a b Leshkowich (2003), p. 97. ^ "Traditional ao dai grace foreign bodies". VNS. December 20, 2004. Archived from the original on December 24, 2004. Retrieved August 24, 2016. ^ "Ao Dai Couture". Nha magazine. Archived from the original on April 8, 2008. Retrieved August 12, 2008. ^ "Ao Dai – Vietnamese Plus Size Fashion Statement". Archived from the original on February 16, 2009. Retrieved July 14, 2008. ^ "Vietnam send Ao Lua Ha Dong to Pusan Film Festival". VietNamNet Bridge. 2006. Retrieved July 13, 2008. ^ Tuấn Cường. ""Nóc nhà" Hà Nội sẽ cao 65 tầng". Tuoi Tre (in Vietnamese). Retrieved April 26, 2009. ^ "Miss Universe contestants try on ao dai". Vietnam.net Bridge. 2008. Archived from the original on July 1, 2008. Retrieved August 2, 2008. ^ "Áo dài cách tân". CANIFA Blog. 2017. Retrieved September 26, 2017. ^ "Nhà thiết kế Minh Châu khoe áo dài cách tân". VnExpress. 2014. Retrieved April 17, 2014. ^ "Áo dài cách tân đang bị phá nát, biến dạng?". Dân trí. 2017. Retrieved September 26, 2017. Wikimedia Commons has media related to Áo dài. Ao Dai: Clothing with a History, an article about Ao Dai at myvietnamhandbook.com – a blog about Vietnamese culture.